NJ Y Camps signed a deal with the Hess Corp. to allow gas exploration on the site of its Nesher and Shoshanim camps near Lakewood, Pa.
Fracking, the controversial technique for extracting natural gas that energy companies are promoting as America’s path to energy independence, has come to the sunny, idyllic world of Jewish camping. 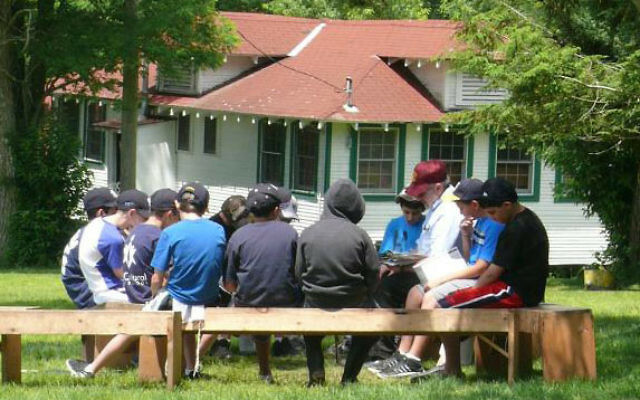 Four Jewish summer camps — including the New Jersey YM-YWHA Camps — have signed leases with gas exploration companies that could allow the deep-bore drilling technique at their campgrounds by this fall. The technique is criticized by many experts as damaging to the environment. Although the leases were signed in 2008 and 2009, an interstate regulatory body has put a hold on natural gas drilling in Wayne County, Pa., where the four camps are located. But that hold could be lifted in September. The leases, all of which are held by the Hess Corporation, highlight tension between environmental concerns over the new drilling technique, which has drawn opposition from most Jewish environmental groups, and the significant paydays that gas companies can offer the not-for-profit camps. “This thing is so much bigger than we are,” said Leonard Robinson, executive director of the NJ Y Camps. His organization received $400,000 upon signing an oil and gas lease with Hess in 2009 on a property that houses two summer camps, Nesher and Shoshanim in Lakewood, Pa. “We realized this is way beyond us,” Robinson said. Of about 30 Jewish summer camps that sit above the Marcellus Shale — a massive geological formation covering parts of four states — four told the Forward that they had begun negotiations with gas companies and never signed deals or, in one case, ignored a query from an interested firm. Another four Pennsylvania camps told the Forward they had signed deals with gas companies. 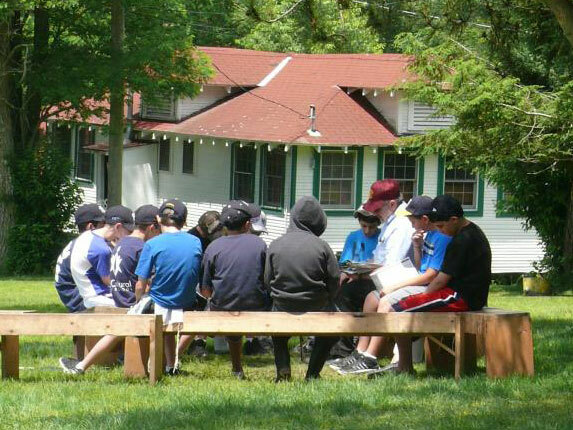 Those are Perlman Camp in Starlight, which is owned and operated by B’nai B’rith; Camps Nesher and Shoshanim, which share a property in Lakewood and are owned and operated by NJ Y Camps; and Camp Morasha, an independent camp in Lakewood. B’nai B’rith and NJ Y Camps signed leases with Hess in 2009, while Morasha signed a lease with Chesapeake Appalachia, LLC in 2008. Chesapeake later transferred the Morasha lease to Hess. Hydraulic fracturing, or hydrofracking, is a relatively new technology that allows extraction of natural gas from previously inaccessible formations of tightly packed shale. Drill crews sink wells deep into the ground and then drill horizontal bores thousands of feet across the rock. The crews blast high volumes of water mixed with sand and chemicals through the bores, breaking up rock formations and releasing natural gas. The fracking of a single well creates more than one million gallons of wastewater awash in pollutants, including some radioactive materials. Environmentalists worry that this water could escape from the wells and taint nearby water supplies. The United States Environmental Protection Agency has announced a study of the impact of hydrofracking on drinking water, to be completed by 2014. Though the technique is currently banned in New York, wells have been drilled in parts of Pennsylvania. The technology used in the wells could allow extraction of gas without any well pads being placed on the camp properties. But the drilling companies do have the right to drill wells at the camps — in some cases, during camping season. The terms of the agreements with Hess included significant paydays for the camps. The NJ Y camps, whose property is much larger than B’nai B’rith’s, would receive bonus payments totaling $3,486,372 by 2015, plus 20 percent of the gas profits. It is difficult to estimate what the royalty payments will come to in dollars before the wells are drilled. But hydrofracking advocate Timothy Considine, a professor of energy economics at the University of Wyoming, said that if the wells in Wayne County prove as productive as those in neighboring Susquehanna, they could be exceedingly profitable. “The royalty incomes are very significant,” he said. No drilling activity has taken place yet at any of the camps. All are located within Wayne County, which saw intensive efforts by gas companies to secure leases beginning in 2007. Those efforts slowed dramatically in 2009, when an interstate agency called the Delaware River Basin Commission effectively blocked new hydrofracking wells in areas draining into the Delaware River as the commission considered new regulations. In December, the DRBC issued a draft of those regulations, which must be approved by the agency’s commissioners — the governors of New York, New Jersey, and Pennsylvania and a representative of the federal government. A DRBC spokeswoman said that a vote would not come before September. A spokeswoman for Hess said that it was too early to say how long it would take to begin drilling after the DRBC settles on its new regulations. All three of the camp leases contain some provisions to mitigate environmental risks. The gas companies have promised the camps to repair or replace their water supplies if they become contaminated due to drilling, and the leases also force gas companies to select surfaces for drilling and construction in ways that minimize erosion. The NJ Y and B’nai B’rith leases, whose terms are identical, are based on a mega-lease negotiated by a landowners’ group called the Northern Wayne Property Owners Association. Robinson said he chose to work with the owners’ group because of what he saw as its commitment to environmental safety. The NWPOA lease fails to explicitly bar companies from drilling during camp season — a protection included in the Morasha lease. Robinson said that Hess told him they wouldn’t drill during the summer. The NJ Y and B’nai B’rith leases bar drilling activity within 500 feet of existing structures and allow the camps some say over where the drill pads are placed. They also require that the gas company choose locations that do not “unreasonably interfere” with the camp’s use of the property. The Morasha lease keeps surface operations 1,000 feet from existing structures. Hydrofracking in Pennsylvania has not been without recent incident. In April, 10,000 gallons of hydrofracking fluid spilled over a well’s containment berms in Bradford County. Some of the fluid made its way into a nearby stream. In a phone conversation with the Forward, Robinson defended his camp’s decision to sign the Hess lease, saying, among other things, that he felt he had no choice under Pennsylvania law. Gas companies, he claimed, could eventually force landowners to take payment for their resources if enough of their neighbors signed. But, in fact, such laws don’t apply to Marcellus Shale wells, though they do affect other areas of the state. Stephen Saunders — an attorney based in Scranton, Pa., who specializes in oil and gas law and in environmental law and represented B’nai B’rith during its negotiations with Hess — said that Robinson’s misconception was a common one. Some of the agents seeking leases on behalf of the gas companies, known as land men, were known to misrepresent the Pennsylvania law in order to convince landowners to sign, according to Saunders. Activists say that the camps signed their leases before public furor over hydrofracking reached its current peak and before information about the practice was widely available. Mirele Goldsmith, an environmental psychologist, last March wrote an opinion piece in the Forward urging Jewish camps to reject such deals. “They probably didn’t understand what they were doing,” she said. But in recent months, concerns over fracking have escalated. Reform Jewish Voice of New York State, a project of the Union for Reform Judaism, supports New York state’s current moratorium on the practice. (Gov. Andrew Cuomo has indicated that he will seek to lift the ban in parts of the state.) In a statement, the Coalition on the Environment and Jewish Life, a program of the Jewish Council for Public Affairs, also expressed reservations about hydrofracking. This article was excerpted with permission of The Jewish Daily Forward. For more on this and other stories, visit www.forward.com.